What to Do About a Flooded Car | The Voss Law Firm, P.C. As Texas residents work on drying out their homes, submitting insurance claims, and cleaning up after months of severe spring flooding, many people are also wondering what to do about their flood-damaged vehicles. 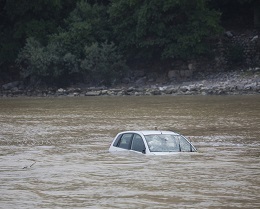 The good news is that flood damage is often covered by comprehensive auto insurance policies. However, to take advantage of the coverage you carry, you still need to initiate the process and guard against further damage. Here are some ways you can make sure that the damage to your car is taken into account. Locate your vehicle. In many areas, vehicles were picked up by flood waters and moved sometimes surprising distances. If you aren’t sure where your car is, contact your local police department to check the abandoned and unclaimed vehicles they’ve taken in and ask for further instructions. You should also let your auto insurance company know what has happened and the steps you’ve taken to locate the vehicle. Don’t try to start the car. Starting a flooded car can make the damage worse. If you’re unsure if your vehicle has been flooded, take a careful look at the seats, carpets, trunk, gauges, air filter, and other areas of the vehicle for signs of water damage or moisture. Take pictures of the damage if you have a camera handy, and wait to notify the insurance company before making repairs. Review your car insurance policy. It’s important to understand the coverage you carry for your vehicle. If your car insurance is liability only, then you won’t be able to collect payment for the damages. However, if your coverage is more comprehensive, then you probably can make a claim for your losses. Coverage can vary quite a bit from policy to policy, so the best bet is always to review your specific coverage. If you are still making payments on your car, be sure to ask your insurance company how that will affect your coverage and any checks that are issued. Report the damage to your car insurance company. Be prepared for a wait, as many policyholders across Texas are reporting flood damage to their cars, and many insurance companies are overwhelmed with calls. However, your insurance company should still attend to your claim within a reasonable amount of time, so don’t be afraid to look into your rights if you feel your insurance claim has been wrongfully delayed. Take steps to avoid further damage to your vehicle. If the interior of the car is still wet, you’ll need to take steps to avoid mold growth and other damage while you wait for your claim to resolve—and leaving the windows down usually isn’t enough. You should also take steps to secure the car against looters and vandals. However, before you take the car to a professional or attempt any home measures, make sure you’ve spoken with your insurance company and asked questions about temporary repairs and loss mitigation. If you’ve followed all the right steps and talked with your insurance company, and you still can’t seem to resolve your claim fairly, don’t hesitate to reach out for help. It’s not uncommon for insurance claims to be delayed, denied, or underpaid after a major weather event, and it’s up to the policyholder to take action toward a fair and timely resolution. For immediate help with your questions about a problem with a flood insurance claim for a vehicle, contact the Voss Law Firm today at 1-888-614-7730. Are You Covered for Water Damage to Your Car?